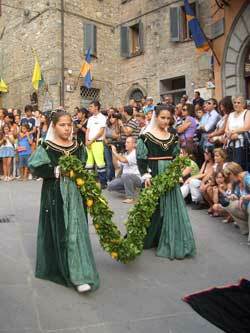 When you enter the walled hamlet of Montone it seems to hear the rhythmic drumming of tamburini or, as soon as you pass the arc, the silvery ringing of clarions; going forward, the gaze rests on the balconies decorated with flags and banners of the Rioni. However, it is only a vision of the feast that will come! The big moment, the big event of the summer (August 16-23 2003) is coming: the historic commemoration of the Gift of the Holy Thorn. Everyone is endeavouring to give the best of himself/herself. Montone is a small community, but the rivalry between the quarters is very turned on and strong: Porta del Borgo, Porta del Monte and Porta del Verziere. Every detail of the representation is kept secret until the last day because it must be a surprise for everyone! The names of the members of the jury must stay secret as well: an expert for scenic design, one for historical accuracy and one for acting. Only the order of the representations is known: the Announcement of the Challenge on Monday, Archery on Tuesday, the scene by Rione del Monte on Wednesday, the scene by Rione Borgo Vecchio on Thursday and the one by Rione del Verziere on Friday. The associations are evaluating the possibility of representing several scenes of daily life, such as the ancient crafts or the processing steps of handicraft products. The Pro Loco Montonese directs every aspect of the representation: this association has been recently renewed with the arrival of young forces, such as Elena Capecci (President) and Filippo Bani (Vice president) who have many ideas and who want to commit themselves to the life of the Pro Loco. 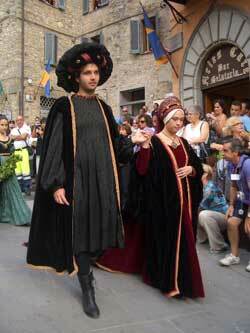 The aim is to being able to fit into a fruitful direction by stimulating the natural rivalry among the Rioni, to deeply live every initiative promoted in the community of Montone. As a sign of this commitment, the Association has destined a small part of its revenues to restore the Reliquary of the Holy Thorn, which is now hosted in the cloister of St. Agnese. The Pro Loco also realizes a lot of initiatives during the year: Christmas, Carnival, Easter, the Social Dinner and it collaborates with other associations in the territory too, as well as with schools. Solidarity is one of the strongest aspects of the activity of the Pro Loco and for that reason a large delegation has gone to visit the community of Bucchianico (CH): here came Braccio to help the locals defeating the enemy during a siege. Born in 1850. 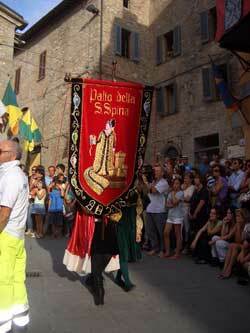 Montone is a medieval municipality in the heart of Umbria. 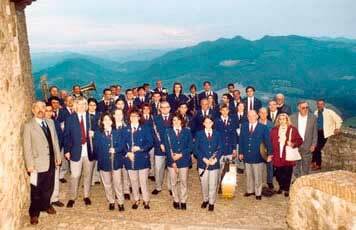 The band consists of about 35 elements. It takes part in music festivals. It is available for any exchange with other bands.